As the leading provider of health and safety services to the homebuilding industry, the NHBC Health and Safety Awards are the UK’s only health and safety awards scheme exclusively for home builders. Primarily designed to recognise and reward the very best in health and safety, the awards, now in their eighth year, aim to drive up safety standards in the industry by showcasing and sharing best practice. All of the competing sites have been visited by NHBC Health and Safety advisors and were scored against the highly stringent health and safety standards set for the competition. Ian will now go on to compete for the Highly Commended and National titles, with the winners being announced at a gala event on 7 July 2017. John Stephen, Managing Director said, “We are delighted that Ian is being recognised for such a prestigious industry award. 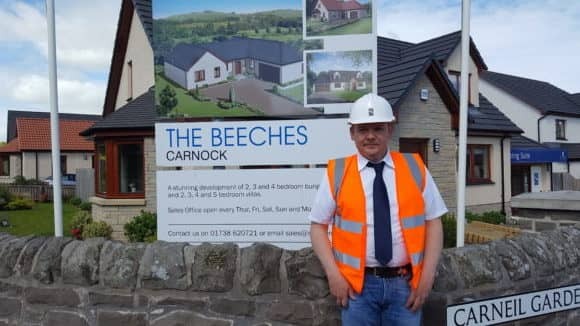 Ian’s approach to Health and Safety in general and to the management of those operating at The Beeches, Carnock is first class. It will be no surprise to his colleagues that he will be commended for his efforts in an area that we as a company put great focus on. Well done Ian”. Every year, several thousand construction workers are injured whilst working on a building site. Through effective management of working areas and access routes many of these could be avoided, whilst also helping to reduce the number of working days lost to a business. The matter of health, safety and environment (HSE) continues to be one of the top priorities in housebuilding and construction. For more information, visit www.stephen.co.uk or www.nhbc.co.uk.